With a mission to help people live healthier lives, Noom guides their users through behavior change programs to create lifestyle habits and target global health challenges. Available first on Google Play, Noom has achieved success through expanding into more international markets, taking advantage of Android’s global reach. In addition to translating their app to five languages and their store listing page to 11 languages, Noom conducted extensive analysis to determine the right financial model tailored to each international market. This included evaluation of their competitive landscape and local health and wellness spending behavior, in addition to running pricing experiments to determine the optimal offering between subscriptions, IAPs, or a premium app. When Noom started researching the Korean, Japanese, German, and Latin American markets, they immediately focused on localizing their food database. Using a combination of local food editors, existing food databases, and user suggestions, their app now includes local cuisine and popular packaged food brands, offering a simpler and more comprehensive experience for users. Hiring local coaches not only removed language barriers, but also reduced response times as they are located within the same time zone as their users. Using various notification types, Noom has increased user engagement by three to four times. 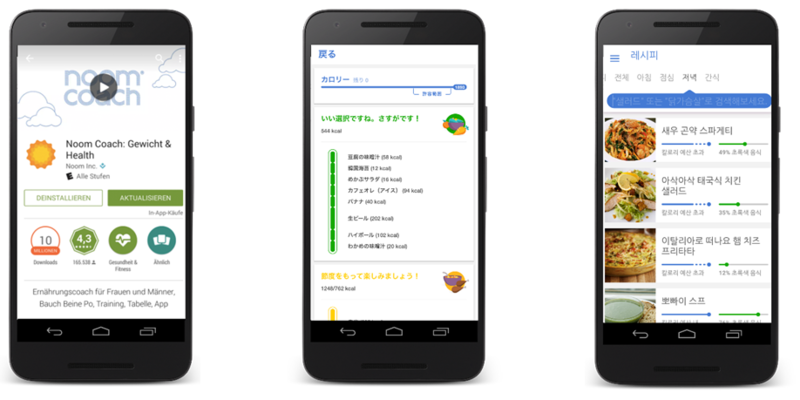 "Android's global focus and great localization tooling made the decision to go global much easier. Localization to new markets has been a consistent growth driver at Noom," said Artem Petakov, co-founder and President at Noom. Over the last three years, Noom’s localization efforts led to an 80% increase in international revenue growth on Android. In Japan alone, revenue increased more than 480% during the same time period. To identify future expansion opportunities, the team looks towards countries with strong Android penetration and install growth using the English product and plans to apply their localization methods to achieve even greater success. Learn more about Notifications, and find out about app localization and how to Expand Into New Markets.